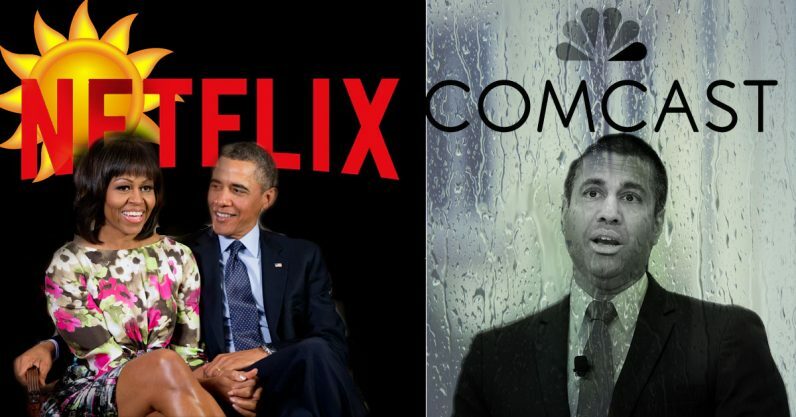 Netflix announced a production deal with President Barack Obama and First Lady Michelle Obama earlier this week. Investors must have found the news enticing, because now the streaming media titan has passed Comcast in market value. What’s up: Bloomberg reports Netflix, for the second time this week, is worth more than telecommunications company Comcast – perhaps best known for its mutually-beneficial relationship with former Verizon laywer Ajit Pai. This time, however, there could be some staying power in Netflix’s lead. Facing an impending threat from Disney’s upcoming streaming service, Netflix has more than doubled down on its production spending, and plans to have more than a thousand offerings of original programming by year’s end. It’s likely these moves, which send a clear signal that Netflix is a production company as much as a provider, have lead to the company’s recent uptick in market value. But the Barrack bump probably didn’t hurt. The big picture: Disney can’t help but see the writing on the wall. According to to Nasdaq.com Netflix is a couple of coins from Scrooge McDuck away from surpassing Mickey Mouse’s house in market value: Comcast is worth $147.15 billion, Netflix comes in second at $147.15 billion, Disney leads this ridiculous trio at $153.36 billion. Who knew a company built on saving people a trip to the local Blockbuster would end up giving Disney and Comcast a run for their money? Millions upon millions of cord-cutters, that’s who.